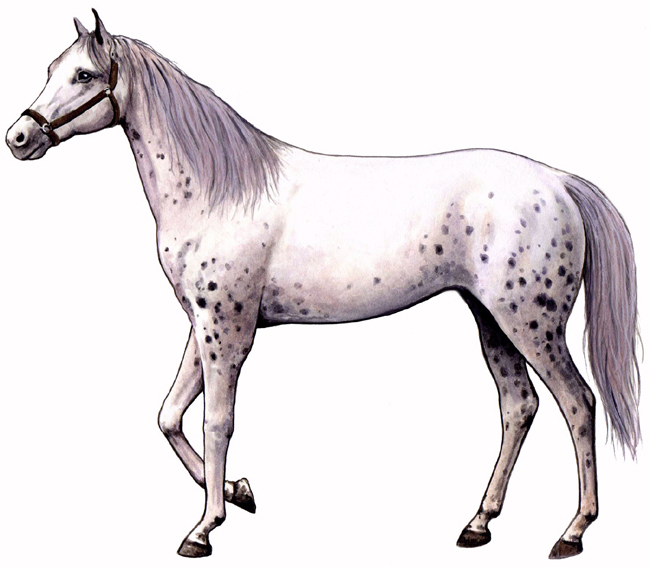 The history of the Spanish Jennet horse began in Ancient Spain and developed in Medieval Spain as the product of the chance collision of several worlds and their horses. The mingling of these cultures and their mounts sparked the flame that became the world's finest riding horse - the Spanish Jennet. 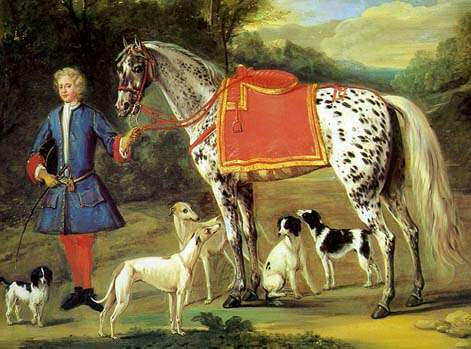 The 18th C. English painter John Wooton painted many spotted horses including a leopard horse specifically titled "Lady Conaway's Spanish Jennet". About 3,500 years ago, somewhere in the steppe region of Asia, horses were domesticate. The spotted horses were especially eye-catching and so they frequently became models for the local artisans. Some of those relics have endured to present day leaving us some record of horses during ancient times. The area known as Ferghana (a frontier province of Persia) became a source of supply of spotted horses in prehistoric and ancient times. There are spotted horses in the art of ancient Egypt dating from 1500 - 1300 BC. Spotted horses are depicted in Mycenean art from the 14th century BC. Pinto is depicted in a wall painting in the necropolis of Thebes circa 1415 BC. came to Italy by ship @1000 BC they likely had brought those horses with them from Asia Minor, the steppe region. The Chinese emperor Wu Ti ( 2nd C. BC) eventually secured the "Heavenly Horses" of Ferghana (112 - 101 BC) to import to China to improve and replace the inferior native stock. Among those horses are depicted spotted horses. Chinese trade with the west insured a steady flow of improved horse flesh entering China. Spotted horses have been common in China for the last 2000 years as evidenced in surviving art and persist to present day.